Earlier we discussed some basic terms in reference to singly reinforced sections design. It is important that you are thorough with the basic definitions and have complete understanding of stresses in concrete and steel. You should also possess the knowledge of reinforcement and terminology of beams which includes understanding singly reinforced beam, doubly reinforced beam, under reinforced beam, over reinforced beam and balanced reinforced beam. There are two methods for the design of singly reinforced sections. 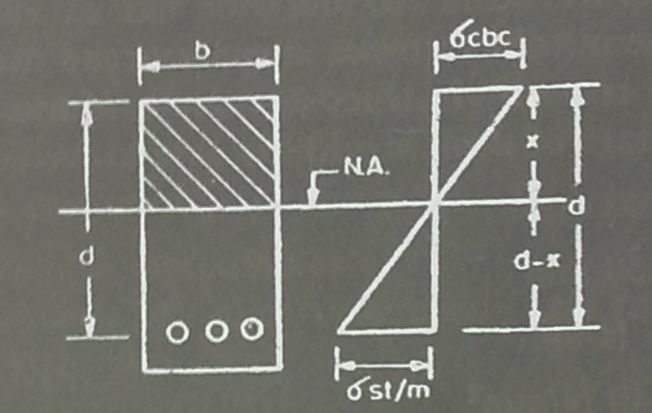 In this article we will discuss the first method of singly reinforced section in a stepwise manner. The discussion will include the method for determining the value of neutral axis followed by a formula for the area of steel calculations. Neutral axis is denoted as NA. There are two methods for determining the neutral axis depending on the data given. In this article, we will discuss the first method followed by a couple of numericals for your understanding and then move on to the second method. We will follow a simple two step procedure. From the above equation 1, the value of x can be determined. Calculation of neutral axis can be done from equation 1 and the area of steel from equation 2. The area of tensile steel is expressed as a percentage (pt) of the effective section. We will post some numericals solved using the same method. However, it is important that you practice enough numericals to get a hold of the design procedure. 1.please provide me required no. of steel rods and diameter for three story building up to D.P.C from foundation 1ftx1ft column. Please can you post the simplest procedures for design of a two story building? Please can you post procedures for design of a reinforced concrete underground water tank? I have learned a lot from what you have posted.